A Game of Shadows starts strong and ends even stronger. Picking up roughly a few months after the events in the first Guy Ritchie Sherlock Holmes movie, things start in classic fashion. Dr. John Watson (Jude Law, Hugo) is at the typewriter, writing about the latest adventure with his frustrating friend, Sherlock Holmes (Robert Downey, Jr., Iron Man). It’s 1891 and it’s a turbulent time. Nationalists and anarchists (so it is assumed) are wreaking havoc, terrorizing the streets as bombings take their toll. 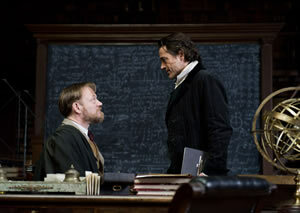 Adding fuel to the fire are the machinations of Prof. Moriarty (Jared Harris, Extraordinary Measures), the shadowy mastermind and puppeteer behind the reunion of Jersey girl Irene Adler and Sherlock. Moriarty’s up to no good and he’s a wee bit peeved that Holmes has meddled with his nefarious conspiracies. But they’re two professionals. They respect each other’s considerable talents. On the romantic front, things are no easier for Holmes. Irene (Rachel McAdams, Midnight in Paris) is back on the streets and she’s one heckuva multi-tasker. She manages to ensnare her tenuous romantic interest, Holmes, with a group of thugs at the very same time she plans a dinner date with the renowned detective. At least she requests the baddies don’t mess him up too badly. Adding insult to injury, though, she also has a lunch date with Moriarty, whose influence changes the course of her curious relationship with Holmes before the movie’s title card manages to make an appearance. A Game of Shadows does what the best sequels do. It takes the lead players, advances their personal stories, puts them in new locations, and introduces new characters. And, like many of the best sequels (The Empire Strikes Back, Indiana Jones and the Temple of Doom, Pirates of the Caribbean: Dead Man’s Chest among them), its tone is darker. It’s also a sequel that builds on the success of its precursor and displays a reciprocally heightened sense of ambition. On a technical note, this one takes Holmes’ classically styled world to a 2.35:1 widescreen aspect ratio and fills the space with some stunning imagery. On a thematic note, it features fabulous storytelling that manages to provide a healthy sense of humor amid a story that serves as a preamble to World War I. Much of the darkness comes courtesy of a very well-crafted and well-cast Moriarty, Holmes’ longtime nemesis in the original Arthur Conan Doyle styles. This rendition proves to be a formidable character, one who can out-orchestrate the best Machiavellian conductors. He’s a genius, a scholar, and an opera buff; he’s friends with the British Prime Minister and has many well-placed connections. And he has eyes on being a war profiteer. Adding a tinge of lightness is the introduction of Sherlock’s brother, Mycroft (Stephen Fry, V for Vendetta). He’s a somewhat cherry-picked version of the Doyle character. As in the original stories, he’s a heavy-set man and pretty much at the same misanthropic level as his brother; but now he’s not merely a government auditor, he’s a man with some hefty weight in the British government’s foreign affairs. The action of the first half is fun and fast-paced, introducing another new character, a gypsy and fortune teller named Sim (Swedish actress Noomi Rapace, who starred as Lisbeth Salander in the original filmed version of the Millennium Trilogy). Her brother is a key facet of Moriarty’s scheming that has included the deaths of several tycoons and magnates around the world. But all that goes on in the first half – the dealings of Moriarty and Adler, the conscription of Sim (amid a faux stag party staged by the severely preoccupied and paranoid Holmes), the face-to-face meeting of the gentleman villain and the Bohemian detective, the travels to France and Germany – serves as merely a preamble for a truly impressive second half. That second half is highlighted by a technically stunning scene of Sherlock and his heroic gang, including Watson and Sim, running through the woods as they attempt to escape Moriarty’s minions. It’s a fantastically presented, breathtaking sequence that takes stop-motion action to an exciting new level. Following that set piece, the movie moves full steam ahead toward a mesmerizing conclusion that brings Holmes and Moriarty to the infamous setting of their final conflict, the Reichenbach Fall. While world dignitaries convene and, behind the scenes, Moriarty pushes forward his plot to push the world into war, Moriarty and Sherlock take center stage and engage in a game of chess, literally and figuratively, above the rushing waters of the falls. Earlier, Watson, a newlywed, berates Sherlock for his lack of friends, his lack of mates. That’s before Sherlock throws Watson’s bride off a train (but at least he meant well). It’s a comment that, toward the movie’s end, reaches a level of triple play. There’s the British sense of “mate” as a friend, the more sexual connotation of a life partner, and then there’s the chess version of mate. All of that runs through the mind as Holmes realizes, to some degree, the mighty Moriarty, very much his intellectual equal, is in a darker sense also his best mate. His best match. Credit goes to screenwriters Michele and Kieran Mulroney (Paper Man) for so neatly threading that theme through the story while also infusing a generous sense of humor that demonstrates an abiding affection for the characters. And credit goes to director Guy Ritchie for further developing Sherlock Holmes as an action star. In A Game of Shadows, Holmes is put through the wringer, emotionally and physically, and his world exposed to a bold new light.